100% pure entertainment. I loved it! Proof positive that having great art direction is more important that purely technical graphics. Awesome game!! The characters were great. Newton got me good. All in all, super fun, great job! Quite enjoyed this! Also thank you for actually making a fairly original horror game! What kind words! Thank you so much for the video, we're glad you enjoyed it! Love the entire macabre Animal Crossing feel. Fun and short experience, and I loved the body horror sprites :) Saved a screenshot of Martin in his hut for a new desktop background. Played it and loved it. The experience was good for a game made within 72 hours. I think we do too! When you only have 48 hours to make a game, a very hard decision of quality vs quantity is there. We think we made the right choice, but would love to make more for everyone who enjoyed it. Stay tuned! Genuinely entertaining game wished there was more by the end - more detailed review in video. It's being talked about! So glad you liked it! Awesome game! Was expecting to be eaten but got a pleasant surprise. I'm glad I played it. If you enjoyed this video then please be sure to SUBSCRIBE here for daily videos! Thank you so much for the play! I love it! No problem. I really do love the game. Super awesome! And thank you! I absolutely adored this game! Looking forward to more content from you guys! Woo! So glad you liked it! :D Thank you for the lets play! I have the game downloaded, but when I try to run it, I get an alert saying it crashed and closed, what do I do? Oh hmm, I'm not at all sure. First time that's come up. Can you tell me as much as you can about the computer you are trying to run it on? Certainly! And thank you for such a fast response! Same things happens for the 32.. The error is very general and not super helpful, unfortunately, and it should run on Windows 10 just fine (runs on mine, anyway). Do you by any chance have an antivirus or other security program running? I do have Kaspersky, could that be interrupting it? Definitely could be, try disabling that and then running it. Haha hi! Lil' Guy doesn't usually feel like doing much but he does enjoy fish- that's about it. As for the statue, it's pretty weird. We're not even sure what it does! Just seems to like moving around sometimes. Hi! i kind of fell in love with this game, and am planning on cross stitching some of the characters! I don't care much to keep the finished cross stitch for myself, but I'd love to send it to you guys! is there any way I could do that? it'll be quite awhile before theyre finished (your pixel art is quite intricate!) but they are nevertheless in the works. Oh my gosh that's so wonderful! If you have a twitter you can DM me through there, either @ghodan_ or @braindeergames. Edit: When I say adjusting options, I mean that sometimes it's been suggested to change certain files to optimize it for someone's PC. By chance is that something I can do to change it for my PC? Hey there! Sorry it hasn't been running smoothly for you. I saw this game when Markiplier played it in his channel and I was hooked! I just had to play it myself and was an amazing game, very fun and interesting. I liked the spooky theme and the upbeat interactions! Would you be going back to this game and expanding it? I would love to play a longer version of it and I would be happy to help with funding as well. Ahhh what kind words! Right now we don't have any concrete plans to expand this game, but we have definitely noted the popularity and are thinking on it. Thank you so much for reaching out! Really awesome concept for a game! Loved the art style and the characters :) It was a great mesh of the two genres! funny, cute, and creepy! This game was just made for me and I love it! This is a fun game to play! With the dart setting in the forest and the spooky sounds in the background, you think that it would be a scary game. It did scare me when they appear out of nowhere while making a loud sound. Actually, it’s pretty cool to talk to many different monsters and help them with their requests! Thanks for making this game! Pixel art was gorgeous. Had that jumpscare feeling at some parts. Some bugs here and there, but overall was a good experience. Nice mix of so cute it's scary type of thing. Wrote down some thoughts about Woodsy. Sorry to hear we let you down! Under strict time limits for jams like this we tend to lose sight of the bigger usability features, in favor of more polish to the narrative, flow, or maybe just one more new feature that we want to sneak in. And since we all have day jobs, it's hard to find time to go back and add those after the event, and that's if we think to even do so in the first place. Anyway, since you've asked, I went ahead and added that feature this afternoon. In the latest build you can go ahead and press Y on your keyboard while playing to invert your Y-axis look, on mouse or controller. Hope you enjoy playing! Super rad pixel art! Quickly caught on to the "do this to get this to do this etc." design of the game. It was executed pretty well for a short game jam! I never found the fish-person though, were they hidden off somewhere? Compiled a short video of my time with the game. Looking forward to seeing what you guys do next! Ahh, gotcha. Thought I had missed a whole area or something. Thanks again for sharing it on itch! I loved this game! It was so cute and the jump scares are perfectly placed to actually startle me. I also got more freaked out by the teleporting statue that most of the designs, but every character looked like they had their own story. Do you have any plans to build the game further? Right now we're all a bit too busy to continue this project, but seeing all the attention its gotten has not gone unnoticed. So maybe? I definitely feel it would be a project worth revisiting. This game is just so wacky in a lovely way! I liked how each of the monsters turned out to be pretty nice and peaceful, but the little scare jumps still got me. 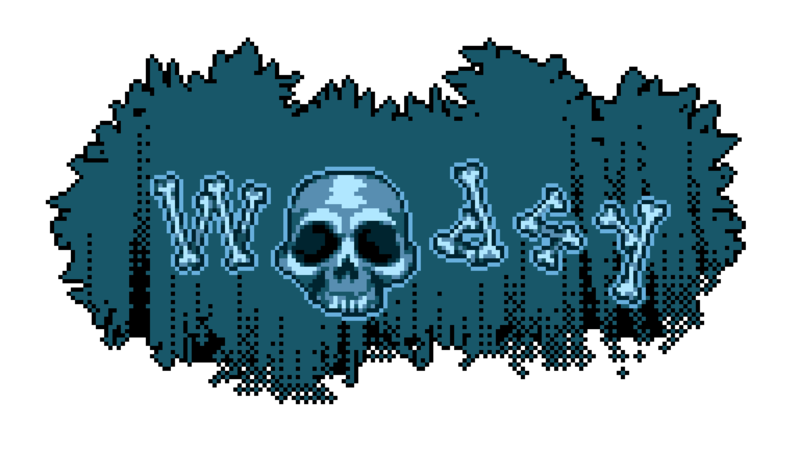 :> The pixel art is beautiful and it all has such a wonderfully creepy atmosphere. The puzzle with the 'thousand-eyed mummy reindeer' (?) was great as well! Thank you for this cute horror game, which I happily recommended along with two other Ludum Dare 41 entries in one of our compilation articles. :) A bit of the gameplay is also featured in the related video. <3 Good luck with the ratings! Hi there, I recently played through Woodsy and quite enjoyed it. I was a bit skeptical at first, I was wondering how you could combine a walkabout style like Animal Crossing with horror but I'm happy to say that it works really well here. Each character has their own unique feel to them, along with a spooky design. I've always been a fan of the pixel art style when it comes to games, and this one is no exception. There are definitely some tense moments in the game, mostly from having a monster jump out at you, but then immediately start having a conversation with you. It's very strange, but it's even stranger that it works surprisingly well. This is definitely one of the more interesting games I've played, mostly that the experience isn't quite like anything else so it's a bit tricky to explain, but I like it a lot. Hope you don't mind but I made a short let's play video of your game for my channel. any plans on doing a mac release? This game was seriously fantastic. Like the title says, it really is comedy horror done right which is great because it is often done wrong! Your welcome! cant wait for any other games you make! It's always nice to meet your neighbours... Just don't be quick to judge them. Sorry I got the name wrong.